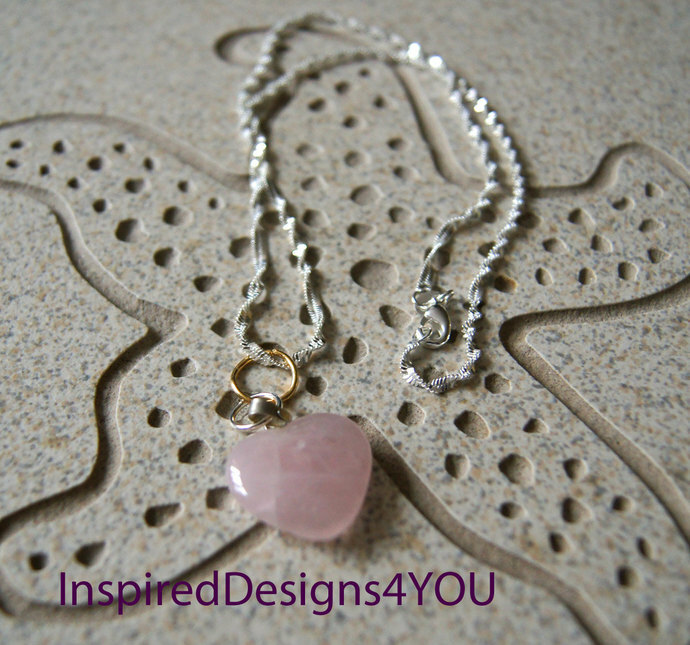 Rose Gemstone Heart Pendant. Beautiful in any colour gemstone choice. 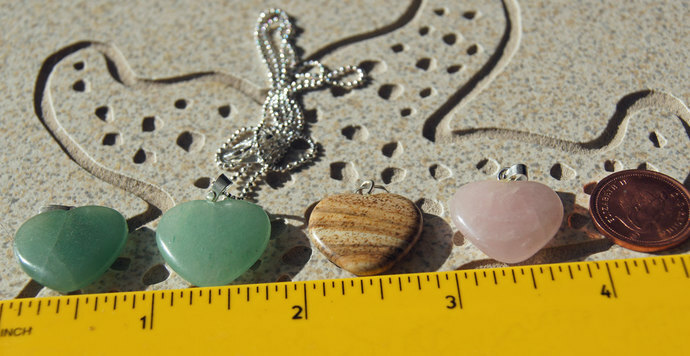 Choose Adventurine, Rose Quartz, Jasper, Sunstone with Silver Chain. Handmade with natural suede cord. 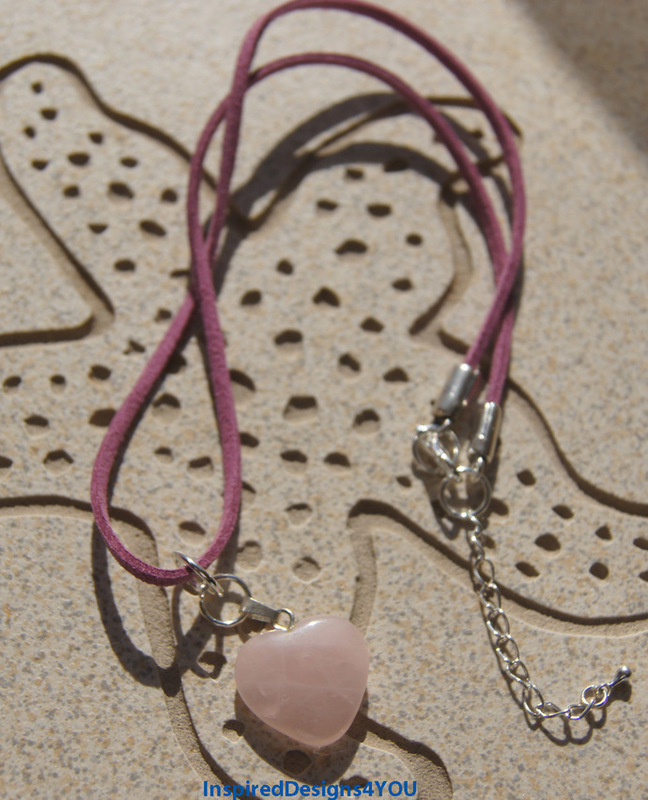 Pick your delightful heart: suspended on a silver bail and 16 inch chain. Photo's the second photo features the Rose Quartz with 'Silver Silk' end caps in copper to brings out the warm features and pink hues of the quartz. The pendant is 0.75 inches at the widest point (2cm) by 0.75 in length (2m). You have the choice of the 16 inches twisted sterling silver cord. Or the deep mauve suede cord. This is finished with 'Silver Silk' end caps in copper With the extender chain adds an additional 1.5 inches to the total length. This item was sold recently here is what my customer said "Excellent customer service. The necklaces are beautiful and fairly priced, and shipped promptly". ^..^ Please convo me before you purchase at the check out!!! ^..^ or else you will automatically receive the silver chain. Quartz is one of the most common minerals on earth and is well known in the gems world. Both attractive and durable, as well as inexpensive. It can be cut and carved in many forms and sizes; it is named after a Slavic word for "hard". There are two main varieties of quartz, though they share the same chemical composition, silicon dioxide. Macrocrystalline quartz, includes stones like amethyst, aventurine, rock crystal, blue quartz, citrine, hawk's eye, prasiolite, quartz cat's eye, smoky quartz, rose quartz and tiger's eye. The quartz is mostly transparent to translucent. Natural inclusions often appear due to nature and geophysics that have taken place over time. This does not effect the wear, this is simply natural characteristics. Often with microscopically small crystals, is known as chalcedony, and includes agate, chrysoprase, bloodstone, jasper and carnelian. Crytocrystalline quartz is usually opaque or translucent. 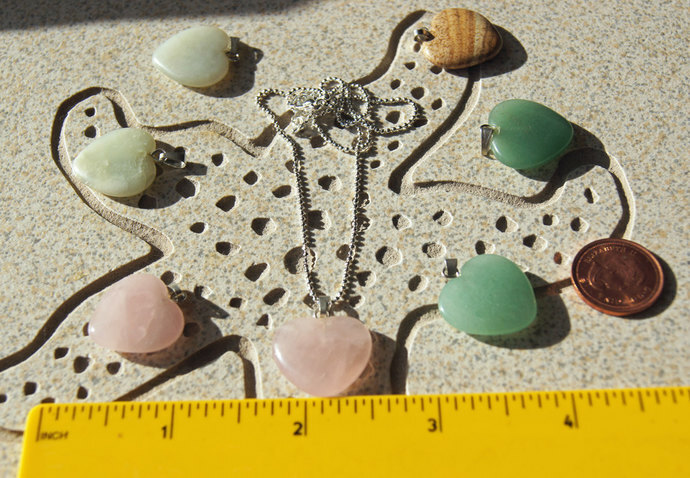 The white and rose quartz are more translucent. From the picture: I have lots of suede cords available to match your wardrobe please ask. Perfect for young teenager, adults, or older person. Shipping is by regular post. Please provide phone number and email address as required by Canada Post. U.S.A and Canadian residents may choose expedited or express post which is trackable and guarantees on time delivery at a extra cost. Please choose from the shipping profiles that suites your individual needs. Happy shopping we are glad you are here!